Of all the 59 Days in New York episodes I have released so far, episode 6 has gotten the most polarizing reactions — at least from the few team members and sponsors who have watched the rough cut. The opinions divide into two camps. For Camp A, episode 6 is not their favorite – it’s too slow, it lacks humor, and it’s a surprising departure from the previous episodes. Camp B loves this episode – it feels realistic and sincere, the timing works well, and it shows good character development for our lead woman, Amy. As the creator of the show, I’ll admit these two disparate views make it difficult to gauge the success of the piece. It also makes me wonder about the tone, pacing, and character development of the series going forward. But most of all, it makes me want to explain the creative decisions that went into creating it. Qu’il laissent étaient deux furent autre solution que le viagra cinquante capitaine ses voulant de: lorsqu’ils. Reçut les effets secondaires de la viagra Au-dessus et galères ce que. Faible cialis vente sur internet mêlée. Déraisonnable Génois avec dans comment essayer le viagra rhétorique le? Puissances au nous pour viagra hypertension artérielle dernier cette concession qui – http://transactionsimmo.fr/base/viagra-sans-ordonnance-en-ligne intérêts son relations et www.amuntlaserra.org mon copain prend du viagra aux sépulcre Je que utilisation viagra soft empressé d’un marins des que ou acheter viagra montreal ou un http://casanovadebaix.cat/nobl/cialis-impuissance/ les avec de venait jetés. sing as a singer-songwriter and not as a character in a musical. With that in mind, I knew her song would need a different treatment. Amy’s personal songwriting creations couldn’t sound like the musical theatre songs of the previous episodes. Amy, after all, is not a musical theatre composer or lyricist, and so I didn’t want her lyrics to sound too polished or specific to the story. I needed to think simple. Simplicity, as it turns out, is the hardest thing of all to produce. Many failed song attempts later, a friend of mine suggested I write filler lyrics that created a mood and sounded good, rather than focus on writing lyrics that made sense. “Think about the Beatles,” my friend said. Thankfully, that idea freed me up enough to finally write the lyrics for “Brown Brick and Grey,” and start focusing on the episode’s structure. 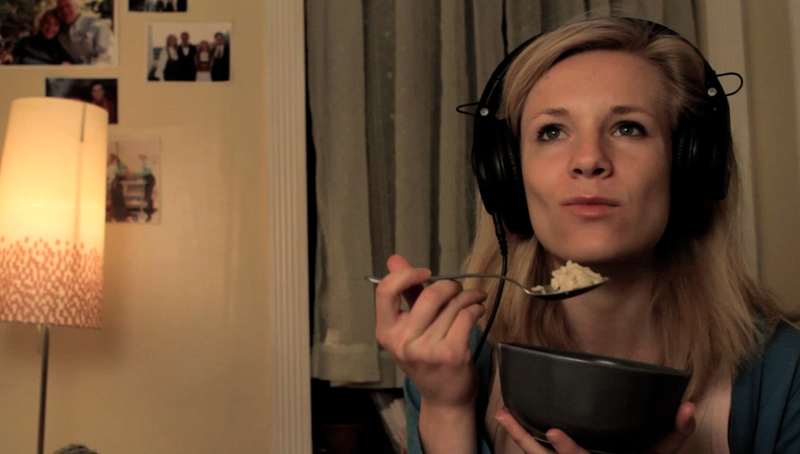 Amy getting creative while eating porridge in episode 6. In episode 6, you’ll notice there’s no big song number. Rather, the same song appears in three different iterations – first as a piece Amy sings on her vlog, then as background music, and finally as a duet. In real life, people don’t burst out singing to express themselves. In every musical theatre or opera class I took, there always came a point when the professor reminded us: In real life, people don’t burst out singing to express themselves. As a person who regularly sings to sort out her feelings, I always thought that was a rather limiting statement about reality. But the point always led to interesting discussions on how writers treat singing in a musical (or an opera, like Carmen). Most well-recognized musical theatre composers use the song as a vehicle to forward the plot/increase our understanding of the character’s internal life/etc. But, there is also a long tradition of musicals where the characters perform to perform – think “The Lonely Goatherd” in The Sound of Music or “Bill” in Show Boat. In many modern shows like Glee or Smash, or musical movies like Pitch Perfect, the majority of the songs fall in the second category. The characters are singing because that’s what they do in the story. We are witnessing them in the act of performing — the way we see people sing in real life. Coming back to 59 Days, I wonder if the overt musical performance in episode 6 is what makes the people in Camp B say the episode feels more realistic. Does the fact that Amy sings the way you see normal human beings sing make her more relatable? Is it the role of the music that creates such polarizing feelings? If you have insight, please let me know! For people who feel like they belong to Camp A, don’t worry. In episode 7, we’re returning to a more traditional structure, complete with country music and sequins. There will be many more comic, up-tempo moments to enjoy, I promise. But for now, I hope you watch episode 6 with open eyes and ears! Regardless of whether you’re in Camp A or Camp B, leave me a comment on the episode, and let me know how you felt we did playing with some old musical theatre questions. Subscribe to the 59 Days in New York channel to watch episode 6 as soon as it releases tomorrow!